The stunning GROHE Allure Brilliant four-hole bath set with hand shower – luxury and architectural style! Creative minimalist design meets state-of-the-art technology! With an impressive faceted design that makes a real design statement, the deck-mounted four-hole GROHE Allure Brilliant bath combination is the perfect finishing touch in any contemporary bathroom. Packed with GROHE’s innovative technology, it comes with a handy diverter so you can switch easily between the tap and the hand shower and is a sheer delight to use. The stylish Euphoria Cube+ stick handshower with 2000mm hose makes washing and rinsing your hair a convenient pleasure. GROHE DreamSpray ensures the flow of water from every nozzle is lovely and even and the handy silicone SpeedClean nozzles are easy to keep free of dirt and limescale! GROHE EcoJoy limits water flow to 9.5 l/min, which saves water and money without compromising performance. The GROHE SilkMove ceramic cartridge of the single-lever ensures the control of water and temperature is smooth and precise. And the durable GROHE StarLight chrome has a sparkle that lasts for many years. Install with the GROHE baseframe (29037000), which is ideal located under a tiled surround. 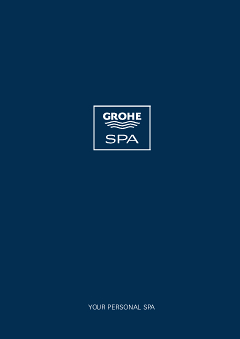 GROHE Allure Brilliant – where cutting edge bathroom style meets luxurious perfection!